A malfunctioning door on your shop or office can cause you to lose business, create safety issues and allow excess wear on your HVAC systems. Our glass experts can repair or replace all types of glass doors quickly and efficiently to get you back to a normal routine in a hurry. 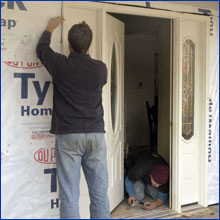 Residential sliding doors are also in routine need of repair and can require a simple fix or possible replacement. For more than three decades, House of Glass has been a leading service provider for glass doors in Essex County. Our expansive modern shop allows us to create custom pieces to get you back in business quickly. Call us today for a free quote on your needed repairs at 973-674-4228. While every situation is different we have fixed so many glass door issues that we think we have seen them all! But even if your residential or commercial glass door requires a repair that is not on this list, let us know and we will be happy to take a look to give you a fast, fair quote. Track Damage – a bent or worn track can prevent the door from opening correctly. Wheel Alignment – simple dirt or debris can cause the wheels to be misaligned. Roller Damage – the rollers eventually wear out and need to be replaced. Broken Glass – it happens. We are experts at replacing it. Door Closers / Locking Mechanisms – may need lubrication, or just get worn out over time. Whether you’re having problems with a door locking mechanism or you need to install a new glass sliding door, you can count on us to provide you with exceptional services. Often homeowners neglect basic maintenance such as cleaning tracks or lubricating wheels which can lead to bigger problems. Our technicians are fully equipped to handle all your residential glass and door needs. 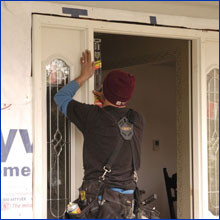 We will let you know if you door can be quickly repaired or if you may save money in the long run by replacing it altogether. With more than thirty years of experience, House of Glass has collected the know how to get your glass door repair project done right. Call us today at 973-674-4228 to schedule a free consultation on any troubles you are having with anything from residential window replacement to commercial glass.